It’s not uncommon for players to announce their retirement as training camp gets underway. It is, however, unusual for a 26-year-old to do it. Ravens center John Urschel says he’s walking away from football. Urschel participated in all of the Ravens’ offseason camps, but it seems that he is opting to pursue a career in mathematics instead. He’s a Ph.D. candidate in mathematics at MIT and is said to be a straight-A student, so there should be no shortage of options for him after football. 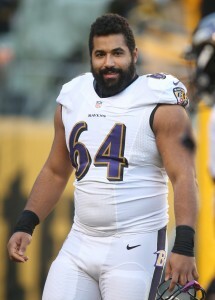 Meanwhile, his surprise retirement leaves the Ravens with a definite void in the middle of the offensive line. Urschel was slated to be the Ravens’ starting center and now that Jeremy Zuttah is no longer in the picture, the Ravens are without a clear cut plan B. Now that the Ravens are in the market for a center, it wouldn’t be a surprise to see them circle back to former Jets standout Nick Mangold. Hensley was asked what the most surprising development of the Ravens’ offseason would be, and he responded with his prediction that Baltimore will pursue a bona fide No. 1 wide receiver in free agency. Such a move would represent a significant departure from the Ravens’ typically low-key approach to free agency, and the team currently does not have enough cap room to make such a splash, but Baltimore needs a big-bodied, athletic receiver to continue the offensive momentum it established under Gary Kubiak in 2014. Quarterback Joe Flacco has never had such a weapon at his disposal, and Hensley believes the time is right to bring in a player like Demaryius Thomas. Of course, if the Ravens do make such a move, they may part ways with Torrey Smith and Marlon Brown may see a much-deserved increased role in the offense. Hensley believes the Ravens should give extensions to starting guards Kelechi Osemele and Marshal Yanda, and that John Urschel will probably take Jeremy Zuttah‘s job as the starting center in 2016. Echoing Conor Orr of NFL.com, Hensley writes that the Ravens are factoring restricted free agent Will Hill into their 2015 plans, and they hope he will win the starting free safety job. However,given the mediocre play of Matt Elam and Darian Stewart, strong safety is still a big question mark. Even if Jimmy Smith and Lardarius Webb can remain healthy in 2015–a very big “if” considering their injury histories–Hensley believes the team’s biggest weakness is at cornerback, and he believes the Ravens should draft a corner in the first three rounds of this year’s draft. Hensley does not see the team using the franchise tag this year. In addition to reportedly locking up seventh-round pick Michael Campanaro, the Ravens have officially signed three more draftees, according to Ryan Mink of BaltimoreRavens.com. Mink writes that third-round tight end Crockett Gillmore, fifth-round guard John Urschel, and sixth-round quarterback Keith Wenning are now under contract with the club. According to Jason Fitzgerald’s estimates at Over The Cap, Gillmore should receive a signing bonus of about $506K, Urschel’s bonus should be about $145K, and Wenning’s should be worth about $104K. With the trio, plus Campanaro, under contract, the Ravens have five remaining draft picks to address, including first-round pick C.J. Mosley. You can keep track of all this year’s draft pick signings right here.